Climbing is a sport that requires you to use your brain as well as your muscles, thinking your way through challenges, and then using physical strength and fitness to navigate your way through that mental map, working your way through new problems along the way. Naturally, therefore, working your way up to the elite level of competition climbing requires a great deal of preparation, training and dedication. To find out more, we spoke to one of our Sporting Champions, Megan Wyatt – British teenage climbing sensation – about her training, how she got into the sport in the first place, how she fits her training in around the hectic life of a teenager and how others can get involved. Megan initially began climbing casually with a friend and quickly became hooked. She enjoyed the sport’s combination of a mental and physical challenge, as it required her to use problem solving skills at the same time as her strength, fitness and technique. Fortunately for her, not long after she began to get really into the sport and take climbing more seriously, the powers-that-be introduced an elite academy, which she was invited to join. 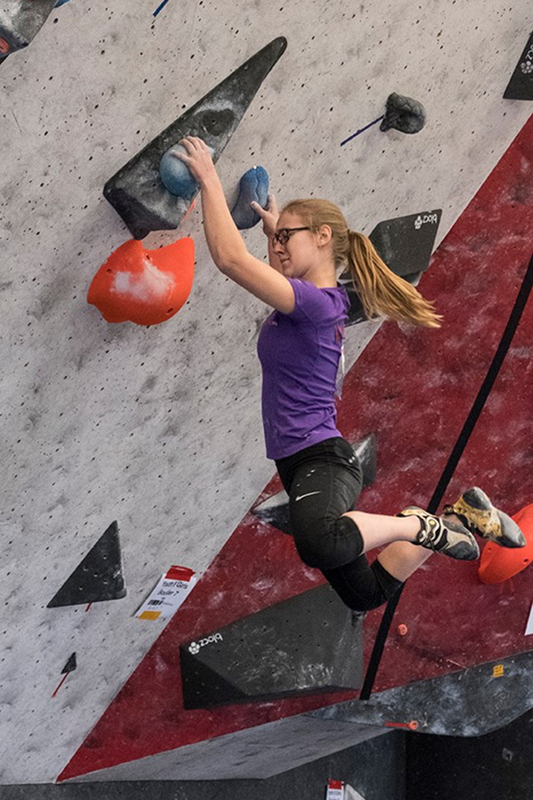 After staying part of that team for a few years, she moved even further up the climbing ladder (or wall) to a more elite team where her coach was working. Training is, obviously, one of the dominant aspects of Megan’s life and she alternates on a week-by-week basis, concentrating on bouldering – i.e. climbing without ropes on low, but tricky walls – one week, followed by leading – i.e. climbing with ropes and a belayer (someone controlling the ropes) at the bottom the next, both of which are overseen by separate, specialist coaches. These sessions take place on Mondays, Wednesdays and Saturdays, while in between, she also visits the gym at her local Everyone active Centre with her personal trainer in order to work on her strength and condition and ensuring she’s in the best possible shape to tackle competitions. Obviously, this takes up plenty of Megan’s time and this, she says is the toughest part of training, saying she doesn’t get a lot of time to spend with her friends, before adding that they are all very understanding. She has, however, managed to make plenty of friends within climbing and it’s this element – meeting new people – alongside the elated feeling she enjoys when she finally cracks a particular target, that she enjoys most about her exhaustive training regime. 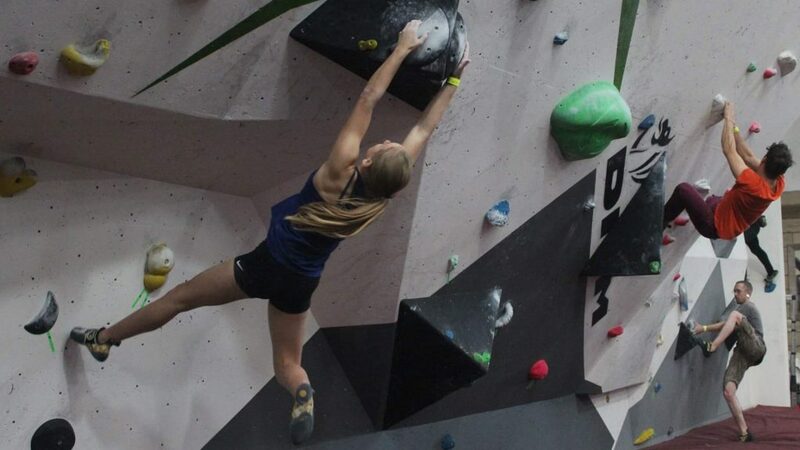 The routine does, however, change slightly in the run-up to a competition, normally focusing more on bouldering, unless she feels the need to work on her endurance, in which case she’ll do more leading training. Two weeks in advance of any competition, she’ll be training intensively and then, in the week before, she’ll reduce the intensity to try and keep her body ready for the travails it’ll endure, but without putting it under too much stress. For any teenager involved in high level sport, balancing their sporting commitments with their school work is extremely tricky. Megan is just beginning her studies for her GCSEs and, although finding that balance is tricky, she’s managed to find a way. Leading up to exams, she will tend to cut back on training slightly to leave her more room for revision, ensuring she can do as well as possible in her exams. According to Megan, just about anyone can get into climbing, with the only real pre-requisites being that you’re generally fairly fit and that you have good finger strength to begin with. You also need to have a positive, ‘can-do’ attitude and an ability to solve problems on the fly. The key, however, is to make sure you’re enjoying yourself. New climbing centres are popping up all over the country – find your local Everyone Active climbing wall here – so it’s getting easier and easier to find somewhere to start. Megan advises heading to your local wall and giving a taster session a go and going from there. Has this inspired you to give climbing a go? If so, find your local Everyone Active climbing wall here and give it a go!